Why am I moving from Visual Studio to VIM? As I mentioned in my previous post I want to use VIM instead of Visual Studio to work on my logcmd project. This would be a kind of an experiment, but I do have some fair reasons behind that decision. Why do I think VIM is a good alternative to Visual Studio? 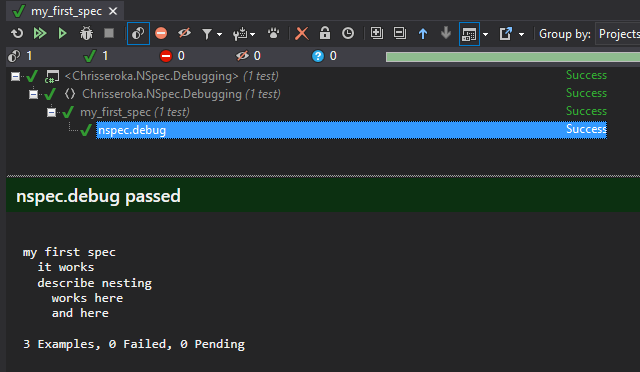 NSpec is purely awesome, although coming with little painful disadvantage – debugging. The default approach (DebuggerShim.cs) is weak because forces me to always navigate to a separate file and change some code. Authors of this great library claim in the documentation that they already work on “fully integrated support”, but it’s not there yet. Fortunately you can apply one simple trick to make it work far better. And that’s it! You can go back to your specs and be delighted by the “unit test” icon beside your spec class. DebuggerShim was a tool (nunit TestFixture) that run some given specification. 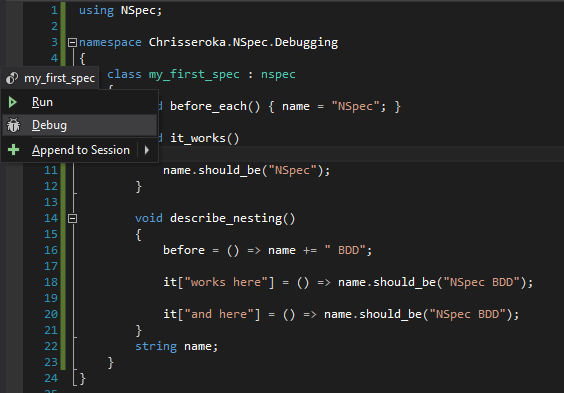 By renaming it to “nspec” class it’s become a wrapper for all specifications. For NSpec it doesn’t matter because it doesn’t care about NUnit attributes nor abstract classes. 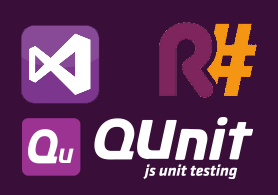 If it’s in the same namespace as other specifications, then we do not have to change anything and Resharper starts to detect it as NUnit test fixture (as it derives from our custom “nspec” test fixture). It runs the whole specification, it’s not possible to debug single context. This is particularly painful in case of big (and slow) UI testing scenarios. In that case I try to split them into several more specific scenarios. 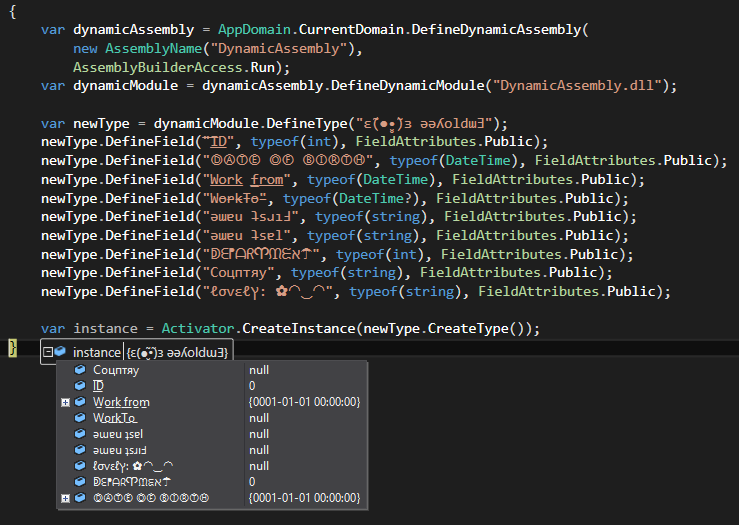 .NET types can have spaces. And not only spaces. I don’t suggest to start writing code like that, but have it in mind while playing with reflection on some external libraries (I guess there would be a problem when serializing such object to XML). 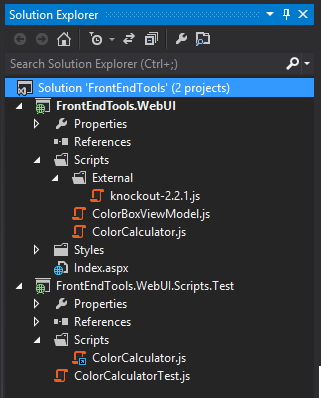 Let’s imagine that we are doing a web application supporting front-end developers. Among all the functionalities we have a simple reusable module to recalculate color values: RGB/HEX. Separation of Concerns is one of the most important things while doing TDD, that’s why I chose “KnockoutJS” as the framework connecting our view with the logic. Architecture of such application is very simple. At the moment we don’t even have any “back-end” code, but still can do TDD. Let’s pick out the ColorCalculator as the target. This is a “class” that is responsible for calculating color values between RGB and HEX. 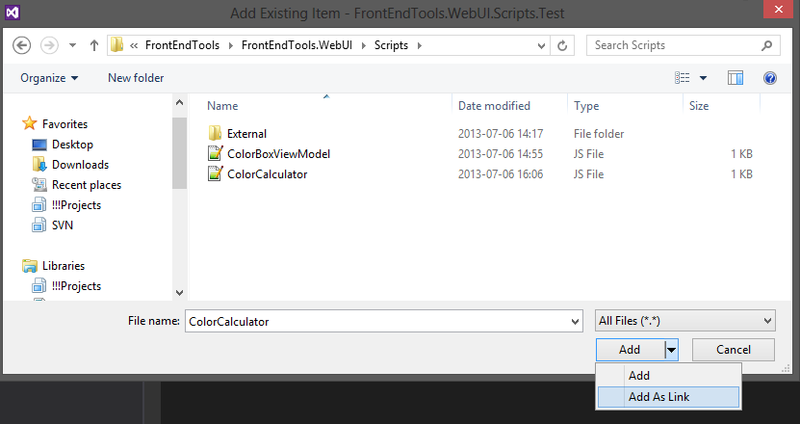 Test result is also shown normally in ReSharper “Unit Test Sessions” window. 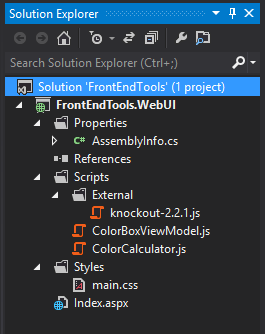 I hope in the next releases of Visual Studio such behaviour will be applied automatically. And that’s it! – after adding some tests and implementing the functionality correctly you can right click the solution, click “Run all tests” and be sure that everything is correct! You need to specify the path to PhantomJS that can be downloaded from here. 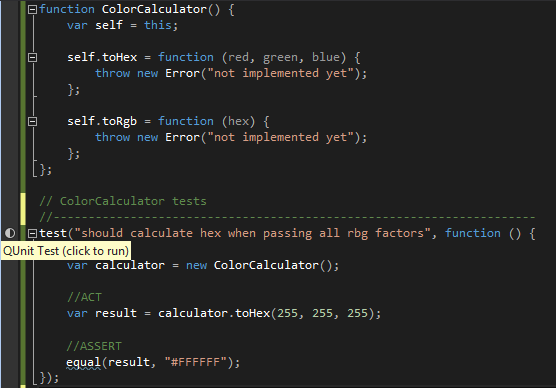 There’s still a lot to do – you can add tests to the ColorBoxViewModel and test “toRgb” function that is far more interesting.